Are you wondering how to become a Plumber? Plumbers are highly skilled workers who install and repair gas, steam, and water pipe systems within residential, commercial, and industrial structures. Plumbers perform a number duties and must possess the training and qualifications to perform a number of small and large scale jobs. 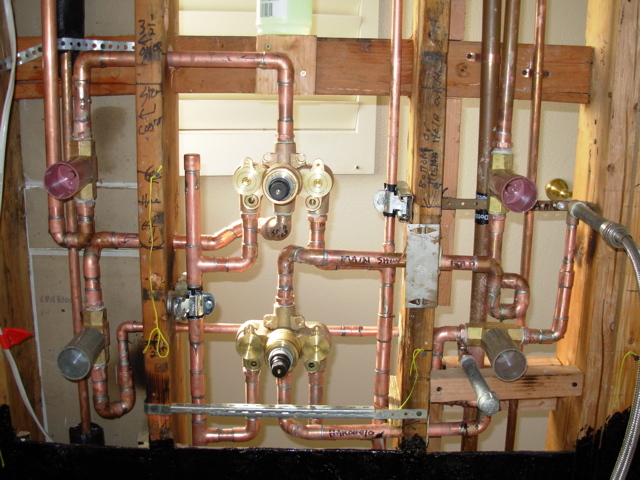 Plumbers must be skilled to complete a number tasks using a variety of tools, like saws, pipe cutters, and pipe bending equipment and securing, welding, gluing, or attaching different varieties of piping. Plumbers install or replace faucets, showers, bathtubs, sinks, toilets, dishwashers, water heaters, and garbage disposals. Plumbers also read blueprints, adhere to codes and regulations regarding the efficiency and operations of plumbing systems, and develop pipe systems which transport water from municipal water reserves or treatment plants to residential, commercial, or public buildings. Plumbers work closely with construction managers, contractors, carpenters, and other craftspersons following orders, assisting with design layout processes of remodeling projects or new construction projects, and installing or repairing water and gas pipes, drainage systems, waste disposal systems, and heating or air systems. Plumbers must have a high mechanical aptitude, manual dexterity, strong mathematical skills, and the physical ability and stamina to work long hours in remote, cramped, and even outdoor locations. Additionally, plumbers often must complete apprenticeships, professional training programs, or college degree programs to gain the educational foundation and work experiences necessary to qualify for employment. High school students interested in establishing a career as a plumber may prepare with courses like: English, mathematics, business, computers, communications, physics, shop, physical education, drafting, and blueprint reading. Many high school students work as a plumber’s assistants to gain hands on experience. Others may complete vocational school programs offered by some high schools. High school graduates or individuals with their GED often advance to apprenticeship or training programs upon meeting age and educational requirements necessary for acceptance. Apprenticeships generally last two to six years and allow individuals to acquire a wide range of skills through classroom instruction and hands on experiences. Individuals generally complete courses based in: industrial skills, mathematics, chemistry, measurement, electricity, pipefitting, safety procedures, ventilation, materials selection and handling, tools and applications, grinding tools, welding tools, drilling tools, print reading, dimensioning, codes and regulations, sketching, and design. Apprenticeships allow students to work closely within hands on settings under the supervision of experienced plumbers to learn basic skills and gradually advance to more complex skills. Individuals who complete apprenticeships often advance to employment or 2 year formal training programs offered at trade or vocational schools as well as community colleges. Associate degree programs offered by trade or vocational schools and community colleges provide students with an expanded knowledge of the technical and theoretical aspects of plumbing. Courses generally include: introduction to refrigeration, HVAC automated design, print reading and interpretation, technical Algebra and trigonometry, Algebra, HVAC/electricity, mechanical systems, building materials application, mechanical systems application, mechanical systems lab practices, acetylene and electric welding, water supply and drainage systems, and piping, venting, fittings, and valves. Graduates who complete associate degree programs advance to employment or continue studies within related disciplines in higher degree programs. Plumbers who complete training and gain work experience are required to complete and maintain certification offered through Mechanical Contractors Association of America, the National Association of Plumbing, Heating, and Cooling Contractors, and unions. Certification programs offer specialized instruction and continuing education necessary to meet and maintain state or employer regulations. Most plumbers work independently or within plumbing contracting businesses and gain promotions as master plumbers, building inspectors or construction managers upon gaining adequate experience. With this information about how to become a Plumber, you’re well on the path to a successful career in plumbing.